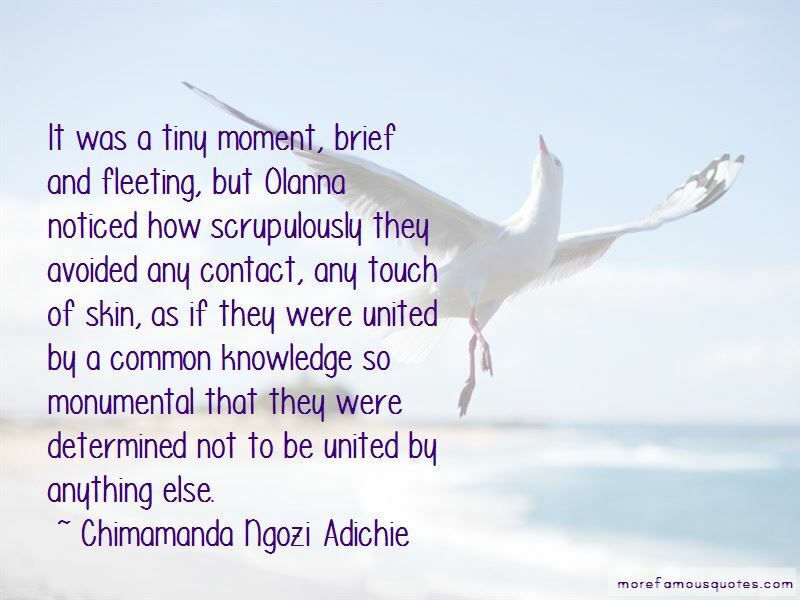 Enjoy the top 436 famous quotes, sayings and quotations by Chimamanda Ngozi Adichie. We teach girls to shrink themselves, to make themselves smaller. We say to girls, you can have ambition, but not too much. You should aim to be successful, but not too successful. Otherwise, you would threaten the man. Because I am female, I am expected to aspire to marriage. I am expected to make my life choices always keeping in mind that marriage is the most important. Now marriage can be a source of joy and love and mutual support but why do we teach girls to aspire to marriage and we don't teach boys the same? We raise girls to see each other as competitors not for jobs or accomplishments, which I think can be a good thing, but for the attention of men. We teach girls that they cannot be sexual beings in the way that boys are. Academics are not intellectuals; they are not curious, they build their stolid tents of specialized knowledge and stay securely in them. You must nod back when a black person nods at you in a heavily white area. It is called the black nod. It is a way for black people to say You are not alone, I am here too. You were praised for humility by people because you did not make them feel any more lacking than they already did. It was like somebody sprinkling pepper on his wound: Thousands of Biafrans were dead, and this man wanted to know if there was anything new about one dead white man. Richard would write about this, the rule of Western journalism: One hundred dead black people equal one dead white person. There was a part of him (her) that dreamed, and he (she) was not sure if that part could ever retreat into an interminable silence. 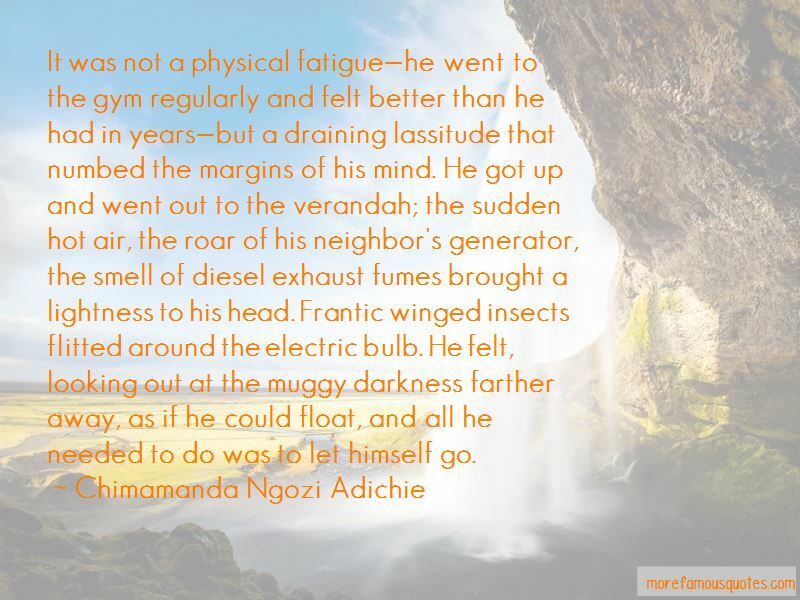 It was not a physical fatigue-he went to the gym regularly and felt better than he had in years-but a draining lassitude that numbed the margins of his mind. He got up and went out to the verandah; the sudden hot air, the roar of his neighbor's generator, the smell of diesel exhaust fumes brought a lightness to his head. Frantic winged insects flitted around the electric bulb. He felt, looking out at the muggy darkness farther away, as if he could float, and all he needed to do was to let himself go. Okay, babe, okay, I didn't mean for it to be such a big deal, he said. My grandfather died in the war, my family went through the war, and it affected my parents in really profound ways. I've always wanted to write about that period - in some ways to digest it for myself, something that defined me but that I didn't go through. I think human beings exist in a social world. I write realistic fiction, and so it isn't that surprising that the social realities of their existence would be part of the story. 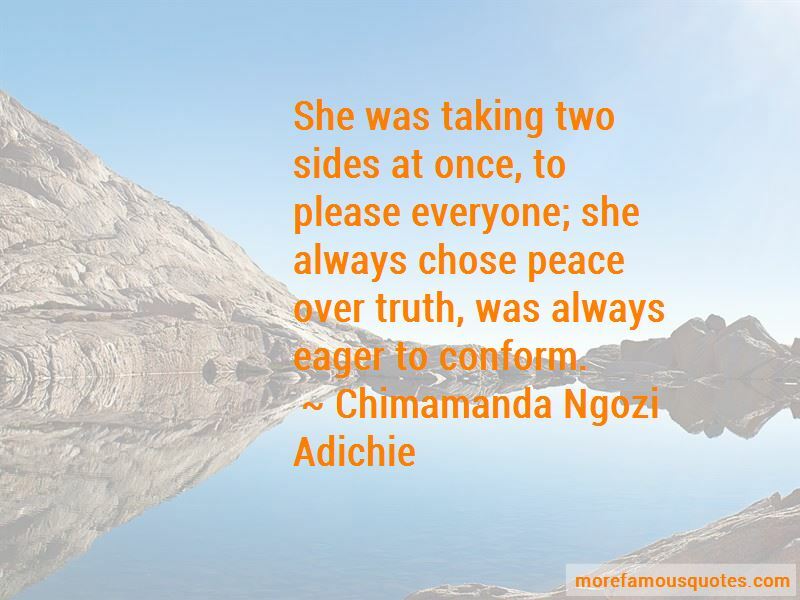 Want to see more pictures of Chimamanda Ngozi Adichie quotes? 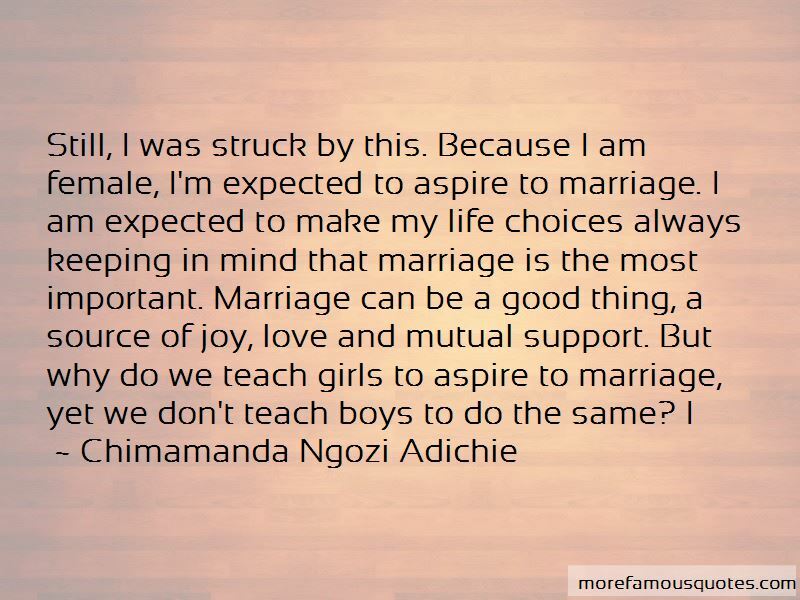 Click on image of Chimamanda Ngozi Adichie quotes to view full size.